This fascinating home on stilts, designed by the expert team at Bertin Bichet in France, in an architectural masterpiece. Built from unusual materials and with a unique stylish appeal, the structure has been carefully thought out in response to the building's position against a slope. The idea was not an easy feat with landscape and eye-catching appeal also taken into consideration when this stunning home was designed. However, this family home is the new type of modern from the exterior to the interior. Join us now for a closer look inside! The exterior view of this home clearly shows how well the space was planned, with adequate parking beneath the home included as the perfect way to park cars out of the elements while maintaining two floors of living space inside. 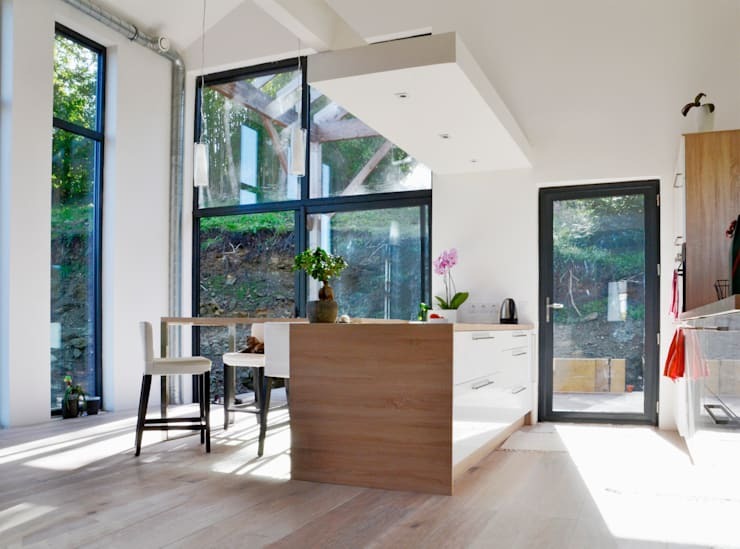 The large and modern windows in different shapes and sizes provide enough sunlight into the home, while the funky design and dark colour gives the home an even more modern edge. 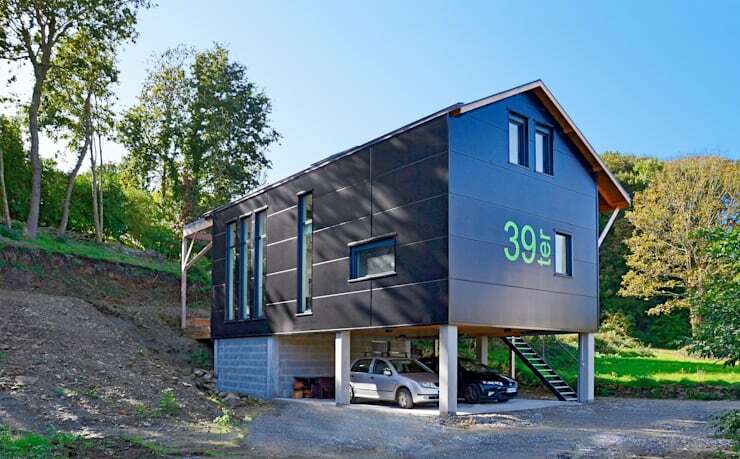 The materials used to build this home is beyond ordinary as well! 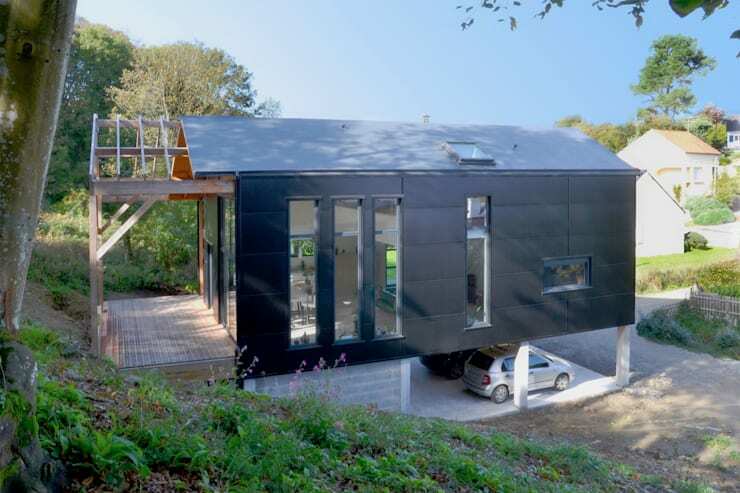 This home has been perfectly thought out in all aspects, from the layout and design to the use of materials such as black metal sheets, matching the original building perfectly. The amount of large windows located at almost every aspect of the home creates a well-lit interior space that is filled with natural sunlight! Here we see a different angle of the home on stilts with the airy entrance to the home coming into focus, who wouldn't want to enjoy a cup of coffee from this makeshift terrace on a chilly morning? This cosy interior at first glance is so inviting, bright and appealing, and the inclusion of large windows at every wall of this home further accentuates the warm feeling. The interior is modern and minimalist with the all-white walls and black window frames creating a monochrome appeal. The decor is simple and elegant allowing the interior to be harmonious, sophisticated and stylish. 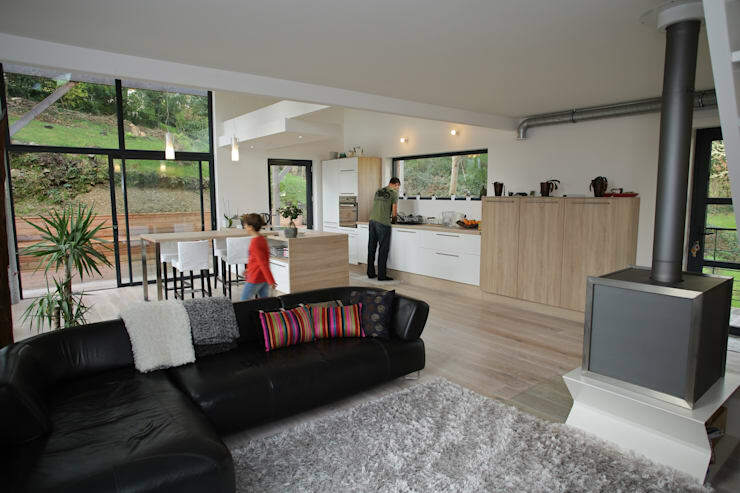 The perfect space for a modern family that want to get in touch with nature again! This house has a perfect living room area which makes the best place to sit back and relax after a long day at work! The designer appeal of this room is decorated to be charming and relaxing with key aspects such as L-shaped leather sofa and comfy grey carpet included to create a cosy space. The living room is made even more incredible by the addition of a fireplace that will generate warmth on those chilly winter days to those blistering cold weeks. Comfort and tranquillity just got a whole lot more amazing with this indoor living room inspiration! This home has a magnificent appeal that is further accentuated through the huge space, which makes this house even more unique! 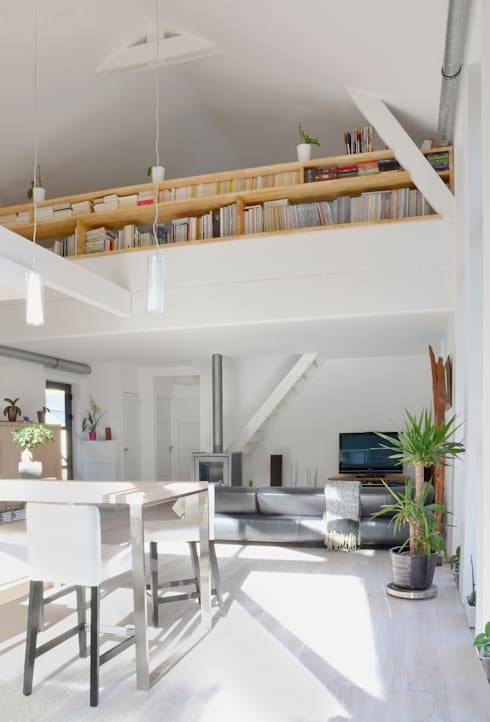 The open spaces in the interior are one of the features the architects maintained in order to make this house seem to have a larger and more spacious interior. More rooms and compartments would have limited the open spaces and given this home a more closeted look. We certainly prefer the design the architects have decided on! This image ends our tour of this spectacular house on stilts! We hope you enjoyed our peek inside! This home is clear evidence that with great planning and consideration of spaces through professional consultation a dream home can be designed. Modern homes surely don't have to be characterless and boring! The possibilities are truly endless with technological advancements and out of the box ideas! 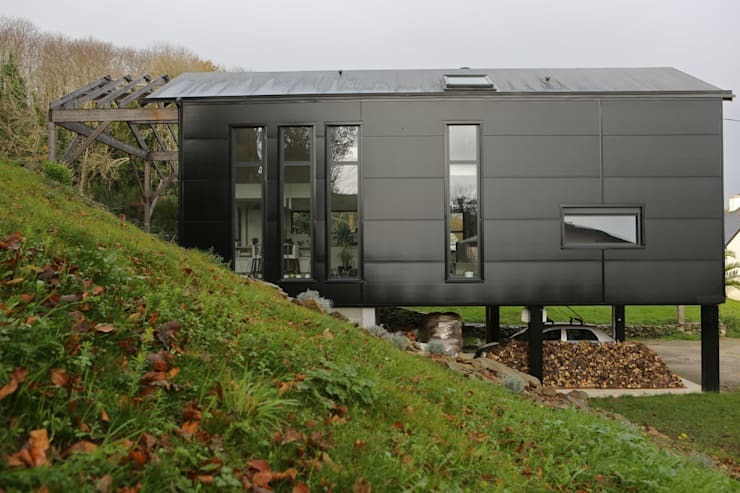 If you liked this Ideabook, get inspired by this one too: Black House at the Lake! Did you like this black metal sheet façade? What about the home's interior? Share your thoughts with us!